First and foremost, this is not a blog about camera technique. Instead it’s more about using a skill you love to mend a bout with darkness. In other words, for me, picking up my camera when I had doubts I’d be able to do many of the things I loved, was the key to my healing physically and mentally after physical trauma. Two years ago, at 1:00 in the morning, you wouldn’t find me sleeping peacefully in my bed. For several months, I sat up in a chair in agonizing pain. I was scared to death and didn’t know what was happening to me. During the day, I couldn’t work my full time job because of the pain, so I would walk several miles a day to keep myself going. Little did I know, I had lost all of the cartilage in my left shoulder and I was walking around with a staph infection just a couple of inches from my heart. How did it happen? Good question. I can’t go into a lot of details, but basically it was a simple procedure gone bad. I had a procedure done the many people have, but I was the one holding the short straw. I got screwed. I went from an active, hiking, biking, forty-something year old mother and wife, to an empty shell of pain and a broken spirit. When they finally realized what was wrong with me, I went through surgery and then what? I was faced with questions about what was my life going to be after this. The pain was still horrible. I was hooked up to antibiotics intravenously, and I was so sick that I couldn’t eat. But, I had a great physical therapist who would visit me daily. She finally brought a smile to my face. I had to keep going. I wanted my life back. I wanted to be strong for my daughter. About eight weeks after my surgery, I picked up my camera and went out to the woods behind my house. I trudged through three feet of snow to get to a good vantage point. I was determined to do something to pick up my spirits. I took some shots. The pain was incredible but I ignored it. It was hard to hold the camera because my whole left arm, shoulder and upper back muscles had atrophied; but I am right handed, so I forced my left hand up to help steady the camera. I was happy. I did it. I did something I love. Maybe I will have that on my list of things I can do. This was the beginning. The surgery was in December and I forced myself to go back to work in February. It was nice to be out in the world again. I had friends there, and I really needed the support. Still, would I ever be the same? I didn’t pick up the camera much until autumn and because I started to hold it so much, my shoulder became accustomed to the position. It still hurt, but I was healing. The amazing thing was that the more photos I took, the more I realized this was bring me to a peaceful place. Photography had always been a love since I was 15, and to realize I could do this and it was changing how I felt, was monumental. I was going to be okay. In February of this year I decided to revive a photography business I started in 2003. I wanted to show that I could do something. They may have broken my spirit. But I was back. I also needed a positive outlet for the bitterness and anger built up because of what happened to me. Additionally, I thought it may help pay off the huge medical debt, but as most photographers know, sales can be hard to come by. But! I’m still glad I did it. So, two years after the initial shoulder trauma, I still go to physical therapy on a regular basis; but I run, bike, hike, and have good quality time with my family. I am so grateful for that. I still can’t raise my arm all the way up and I live with arthritic pain, but you wouldn’t know it if you met me. I’m positive these days and my camera is a big part of that. I’m also very grateful for the friends I have made in this venture and the continued support of my work that I share on social media. If you are ever in a dark place, use what you love to find the light again. It will seem like it isn’t possible, but never give up. You may be surprised. 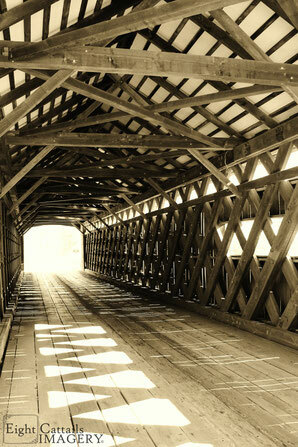 The covered bridge photo shown above was taken a few weeks before my surgery.